Located at the shores of Es Carregador beach and with excellent sea views, the FERGUS Bahía Palma Nova Hotel stands out for its personalised attention, the friendly treatment the staff offers to all its guests and the high quality standards of all their products, from the cuisine to the rooms. In this charming beach hotel in Palma Nova, comfort and relax are guaranteed, either you travel as a couple or you organise a trip to Mallorca with friends: the facilities and services of the FERGUS Bahía Palma Nova Hotel are designed to offer a wide range of plans to each type of traveller: swimming pools, bar, meeting room, free wifi in the common areas, show cooking buffet and a wide range of sport and leisure activities in the surroundings of the hotel. Discover in the FERGUS Bahía Palma Nova Hotel an authentic beach hotel in Costa de Calvià. 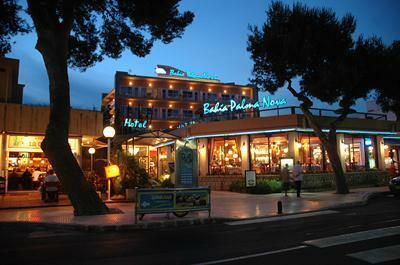 The double rooms of the FERGUS Bahía Palma Nova Hotel are synonymous with quality and fair price. Comfortable and modest, these rooms are especially designed for your rest and enjoyment during your sun and beach holidays: bedroom with complete bathroom, natural light, TV, direct telephone, safe deposit box ($), minibar and terrace… And everything at the heart of Palma Nova!